This rugged Eurolite case holds two CD players (such as the Pioneer CDJ1000 or CDJ800, and the Denon DN S-5000) and a 12" wide mixer. Features low-profile wheels to improve portability, slide-out fronts for the CD players, a completely removable lid, rugged interior construction, metal exterior hardware, reinforced metal corners, and a sturdy carrying handle. The CD player case holds two large-format players such as the Pioneer CDJ1000 or CDJ800, the Denon DNS3500 or DN-HS5500, the Stanton C324, and the Technics SLDZ1200. 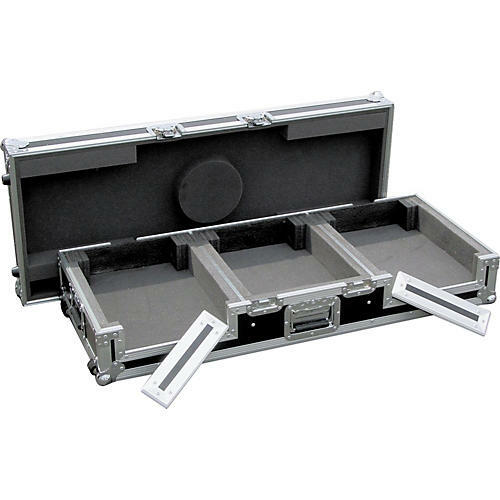 The DJ mixer case holds 12" wide mixer models such as the Pioneer DJM-600 or DJM-800, the Behringer DJX-700 or DDM-4000, American Audio's MX-1400 or MX-1400DSP, the Denon DN-X1500, the Numark 5000FX, and the Allen & Heath Xone.